It’s October. The nights are longer, there’s a chill in the air, and of course Halloween is looming. What better band to listen to this month than cult heroes Uncle Acid & the Deadbeats? Kevin Starrs and company burst onto the scene in 2009, releasing a pair of seedily alluring albums in Blood Lust and Mind Control before slipping a bit on 2015’s The Night Creeper. Here on their fourth album, Wasteland, the band ups the quotient of both psychedelia and lo-fi grit in an effort to out-creep themselves. “I See Through You” fades in with swirling organs and a distorted radio broadcast before an upbeat, hypnotic hook kicks in, followed by Starrs’ fuzzed-up sneer. The song is as catchy as anything one might get in a brothel, although it’s a tad on the long side. Other gripping songs include the groove-laded “Shockwave City” and album standout track “Blood Runner,” which is frantically paced and features killer bass guitar work. Psychedelic weirdness caresses our ears on tracks like “Bedouin” and “Exodus,” and although those songs tend towards the unremarkable, they leave us in a haze of sinister discomfort. In fact, all the songs on Wasteland feature some excellent musicianship, and the fact that we can discern that given the ultimate in lo-fi production is pretty amazing. 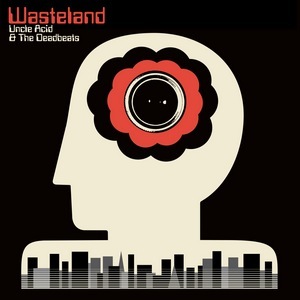 On casual listen, Wasteland is an unholy mess of music with no bass or treble to speak of, as is Uncle Acid’s wont, but a closer listen reveals as much or more detail as more pristinely-produced records. With such a shtick as the band plays off of, though, you need to be writing killer songs to maintain interest, and too often Wasteland trods off in aimless directions. “No Return” is a nine-minute trudge through the sludge, with a lovely, massive riff and a marching bass line, but the song goes on too long, especially with three minutes of droning atmospherics and unintelligible soundbites at the end. Similarly, the title track is morose and atmospheric, but unnecessarily long. Where Uncle Acid excel is the shorter, hard-hitting numbers, where the hooks and psychedelia have an immediate impact and keep us glued to the broken-down radio we’re listening to the songs on. Wasteland is the kind of album one listens to in the depths of a dark alley, huddled around an old transistor radio with several disreputable characters. It’s disturbing, and a bit unpleasant, but at the same time oozes a certain abnormal charisma that keeps you from turning it off. While the longer tracks can move a bit aimlessly, the short, furious numbers make this album one worth checking out.